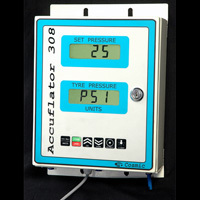 Large Display Automatic Tyre Inflating machines for Petrol Stations, Service Centres, Tyre shops, and Garages.State of the art technlogy for fast and accurate filling of tyres . Special model built specifically for the operations of Tyre shops. Just set the desired pressure, connect the nozzle to tyre, and Accuflator does the rest.